Last year’s heinous gas prices put a new spotlight on small, fuel-efficient cars for buyers and manufacturers alike. While there has always been a decent selection of inexpensive cars out there, recent months have seen the market grow like never before. New options like the Kia Soul and Nissan Cube have worked their way into a segment dominated by plenty of standard features, unique designs and low MSRPs. 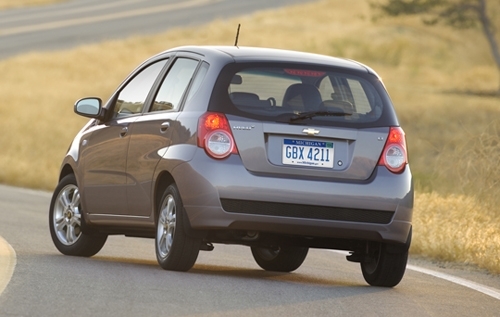 While economical vehicles rarely rake in impressive profits for carmakers, General Motors recognized the need for a low-buck offering in its own stable and brought the Aveo to the U.S. market in 2004. Built under the Daewoo banner in Korea, the Aveo offers good fuel economy, decent space inside and a low sticker price. Unfortunately, a few quick ticks on the option sheet can easily put this subcompact on the same shelf as much more expensive and comfortable hatches. 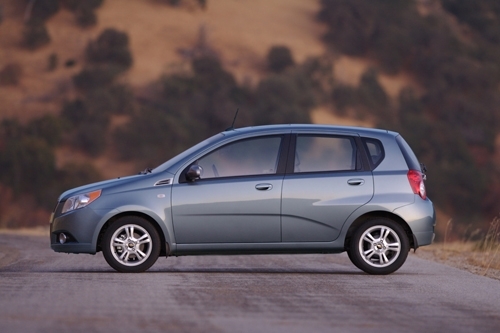 Still, the Aveo manages to do well at what it was designed for – basic transportation. An attractive, familial nose and big headlights ensure the Aveo avoids anonymity in a segment dominated by nondescript cars. The optional, four-speed automatic transmission is incredibly smooth for this segment, and there’s plenty of headroom inside for taller drivers and passengers alike. 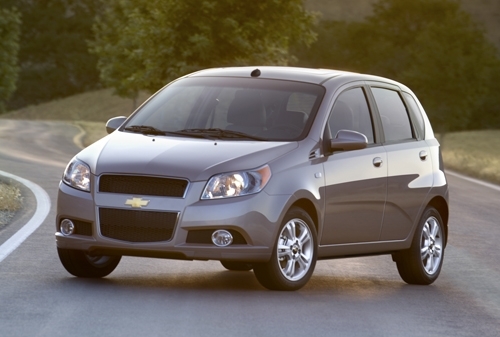 The Aveo5 also boasts solid crash test ratings –five-star front and four-star side impact. The 2LT represents the highest-available trim level for the Aveo and includes amenities like power windows, locks and cruise control. Unfortunately, those are completely unavailable on the base LS model and only optional on the next trim treatment – all standard with most of the competition. The 1.6-liter four-cylinder Ecotec engine can be noisy and the interior is largely what you would expect from a car in this price range. Hard, cheap-feeling plastics abound. Despite having only 106 horsepower, the 1.6-liter four-cylinder engine manages to scoot the Aveo around town without too much heavy breathing. There’s enough power for interstate passes, though the extra gusto is found high in the rev band, making a noisy powerplant even louder. Though we didn’t get any time with the standard five-speed manual transmission, the optional four-speed automatic ($925) is incredibly quiet and smooth-shifting. Visibility is good as well thanks to plenty of glass and large side-view mirrors. While there’s enough room inside for taller individuals, the Aveo’s seats are a little too uncomfortable for long drives no matter where you’re sitting. While leatherette interior ($375) is an available option, we found it to be less attractive than the cloth offering, so don’t bother with the upgrade. The 2009 Chevrolet Aveo5 comes standard with a1.6-liter four-cylinder engine with 106 horsepower and 105 lb-ft of torque and a five-speed manual transmission. Though noisy, the high-revving motor produces plenty of power and still manages to deliver 34 mpg highway. The optional four-speed automatic transmission is costly, but head and shoulders above similar gear boxes offered up by the competition. Though the Aveo5 starts out with a low MSRP, tacking on any number of options can easily see the car’s final price head skyward. Base models are just that – base. In LS trim, everything from air conditioning to a CD player will bump you into the next trim level. Our tester came with a $950 four-speed automatic, as well as optional anti-lock brakes at $440, 15-inch aluminum wheels for $350 and leatherette seats for another $375. Altogether with destination, our final price tag was a hair over $18,000, and that’s a far cry from the 2LT’s base price of just $15,365. Though base models don’t have much to brag about in the tech department, the 2LT trim affords a number of fun goodies. OnStar comes standard for a year, as does three months of SIRIUS satellite radio. The CD player also supports MP3 formats and comes with an AUX input. Bluetooth hands-free calling is also standard on this trim. The Aveo5’s thrifty four-cylinder engine manages to get 25 mpg city and 34 mpg highway, though light-footed drivers should see a few mpgs better than the EPA estimates. Those digits are good enough to beat out every other offering in the subcompact segment, too. Chevrolet’s pint-sized ride falls into ULEV-2 CARB category. 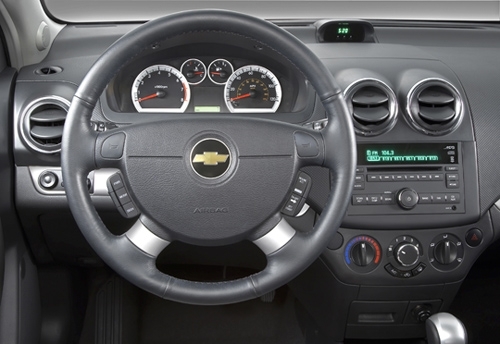 The Aveo5’s dash is fairly attractive with chrome-bezel air vents and a clean center stack, but the rest of the interior is pretty utilitarian. Hard plastic armrests on the door panels and a flimsy feeling shifter in the automatic serve to remind you of the car’s base price. Outside, the Aveo5 is reasonably attractive. It benefits from a stylish front end with a big, low Chevrolet grille and headlights that wrap toward the sides of the car. A bodyline breaks up otherwise brick-like sides and the rear boasts big taillights that keep the back interesting. Though the base Aveo5 will hit your wallet for $12,685, the well-equipped 2LT boasts many of the features the car needs to be competitive. At $15,365, you pay a decent premium for power locks, windows, cruise control and keyless entry. Still, the Aveo5 does well against the likes of the Honda Fit Sport at $16,260 and the Nissan Versa 1.8 SL at $16,100. Meanwhile, competitors like the Toyota Yaris 5-door liftback at $13,305, the Nissan Cube at $13,990 and the Kia Soul at $13,995 may offer better deals depending on your needs. 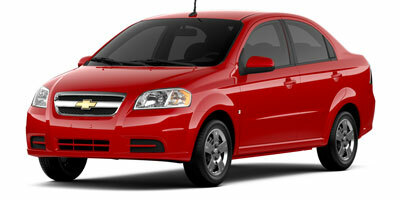 The 2009 Chevrolet Aveo5 2LT is a solid commuter for relatively few dollars. A stout, efficient drivetrain keeps the daily slog from putting a dent in your bank account and the exterior looks are sharp enough to stave off embarrassment when you pull into work. The interior could use some attention to keep up with the ever-tightening competition out there and the ride isn’t comfortable for hauls over two hours, but this is base transportation, not a luxury cruiser.